I just joined "Tuesday Couch Potatoes" meme hosted by Kikamz author of Just About Anything. It's the 2nd edition of TCF, and this week theme is Favorite Husband and Wife Movie. 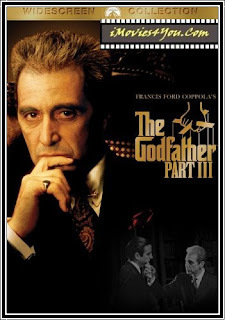 We watched this movie many times, the part 1, 2 and 3 of " The God Father ". I like the part 1 better. Well all 3 of them are good though. 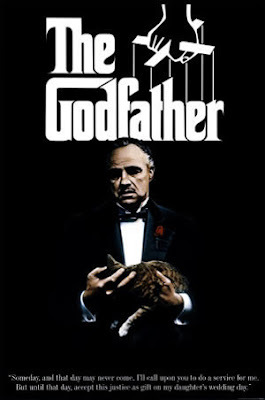 Synopsis: Based on the best-selling novel by Mario Puzo (who co-wrote the screenplay with director Francis Ford Coppola), THE GODFATHER tells an epic tale of Mafia life in America during the 1940s and 1950s.... Based on the best-selling novel by Mario Puzo (who co-wrote the screenplay with director Francis Ford Coppola), THE GODFATHER tells an epic tale of Mafia life in America during the 1940s and 1950s. Vito Corleone (Marlon Brando) is the family patriarch balancing a love of his family with an ambitious criminal instinct. At the wedding of the Don's daughter Connie (Talia Shire), youngest son Michael (Al Pacino) is reunited with his family. A subsequent assassination attempt leaves the Don too ill to run the family business, forcing Michael and Sonny (James Caan), with the help of consigliere Tom Hagen (Robert Duvall), to lead the Corleones into a vendetta-filled war with other mob families. Violent revenge ensues as the family tries to change from its old criminal ways into legitimacy. Coppola's certified masterpiece, which won three Oscars (including Best Picture) and spawned an Oscar-winning sequel (THE GODFATHER PART II), set a new screen standard for merging blood-soaked violence with intimate family drama. In the process, Coppola single-handedly established the Mafia as an industry in film and television (GOODFELLAS, THE SOPRANOS). Featuring truly unforgettable performances, including the Best Actor-winning Brando, the riveting Pacino, and an unexpectedly dramatic Diane Keaton, THE GODFATHER is the pinnacle of Hollywood cinema in the 1970s. The Godfather is an insightful sociological study of violence, power, honor and obligation, corruption, justice and crime in America. Part I of The Godfather Trilogy centers on the Corleone crime "family" in the boroughs of New York City in the mid 1940s, dominated at first by aging godfather/patriarch "Don" Vito Corleone (Marlon Brando in a tremendous, award-winning acting portrayal that revived his career). A turn-of-the-century Silician immigrant, he is the head of one of the five Italian-American "families" that operates a crime syndicate. The 'honorable' crime "family," working outside the system due to exclusion by social prejudice, serves as a metaphor for the way business (the pursuit of the American dream) is conducted in capitalistic, profit-making corporations and governmental circles. This epic story traces the history of their close-knit Mafia family and organization over a ten year period (although the specific words "Mafia" and "Cosa Nostra" are not found in the film's script - they were replaced with "the family"). The presiding, dominant Corleone patriarch, who is threatened by the rise of modern criminal activities - the drug trade, is ultimately succeeded by his decent youngest son Michael (Al Pacino), a US Marine Corps officer in WWII who becomes even more ruthless to persist. Family loyalty and blood ties are juxtaposed with brutal and vengeful blood-letting and the inevitable downfall of the family. Romanticized scenes of the domestic home life of members of the family - a family wedding, shopping, a baptism, kitchen cooking, etc., are intertwined with scenes of horrific violence and murder contracts - a total of 23 deaths litter the film. Over 50 scenes involved food and drink. I enjoy watching The Godfather too. I agree, among the three, the first is the best! It is indeed a movie about the mafia in america, but beyond that, it tells of family loyalty and close family ties. thanks for joining this week mami shy! next week ulit ha? hugs! mahilig pod diay ka ani nga movie tsang? ako sad I saw this before....ganahan baka ug mga romantic movies? hehhehe....amo kasagara tan-awon kay action, comedy, suspense ug horror ra....na miss nako ang mga pinoy movies. Interesting choice though for a husband and wife movie. Yes good pick!! This is one of my very favorites too. I remember when it first came out and the frist time I saw it. It was an incredible experience and every single member of the cast did an incredible job of acting!! Wow, ako gud ganahan mag tan aw movies with hubby, kaya lang comedy, romantic, suspense ug love story lang. sama kang dhemz miss na sad nako pinoy movies; basi mag rent ko tong movie ni sharon ug ai ai sa sunod. Nice choice!I'd seen this too & my husband loves it,hindi nya rin pinalagpas hihihi! !